The National Fire Protection Association® say many home fires are preventable. Use this fire safety tips guide to educate parents and children on the different types of burning dangers. FIRE SAFETY RULES: Help prevent fires with these ten hot tips. Learn how to prevent injury and deaths from fires around the United Kingdom. Practicing fire safe regulations saves lives. It can reduce the devastation and destruction caused by a blazing infernos and fiery explosion. The extra threats from fire hazards should be part of fire prevention rules in local community safety legislation. It should include escape route planning during building constructions. The occupants who live in them should then get taught afterwards 'how to escape a fire' and guidelines. 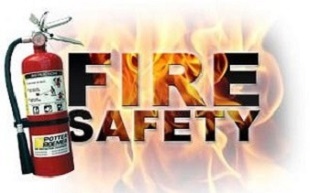 The best fire safety measures include several factors. They include those specifically intended to prevent ignition of an uncontrolled blaze. They involve actions used to limit the development and effects of raging fires once they have started. UK fire prevention and safety should be a component of all 'Building Safety Regulations'. This is because fire hazards often create situations which increase its likelihood and may impede your escape from them. Install a smoke alarm on every level in your house. This is likely to be the cheapest option on fire safety rules and prevention. Fix one inside each bedroom and outside any other sleeping areas. Be a super 'fire preventative parent'. Interconnect all the home smoke detectors together. Thus, if one sounds the alarm - they all go off! After installation you should test each smoke alarm at least once every month. Remember to replace batteries regularly (at least once a year). Note: Most devices will give you a 'chirps' warning to inform you that the battery is low. Smoke alarms more than 10 years old should get discarded and replaced. Commercial fire sprinklers can be expensive to install. The cheapest time to fix a fire sprinkler system is during the construction of a home at the beginning. Even so, there are other opportunities to install a residential fire sprinkler system. Such as any time you remodel your home. Fire sprinklers would help to contain a blaze and may even completely extinguish a fire. The safety rules fire department advice is to remain inside the kitchen any time you are cooking. It is best practice to turn off the stove if you need to leave the frying, grilling, or broiling food unattended. Note: Fire and Rescue Services provide a list of barbeque fire safety advice and tips for charcoal grill fires. As a rule, install fixed and portable space heaters at least one meter from any materials that can burn. Always turn off heaters when you leave the room and especially when you go to sleep. Most smokers will smoke outside when you ask them to. Provide any cigarette and cigar smokers with deep and sturdy ashtrays. Keep firelighters, matches, and cigarette lighters high up and inside cupboards. They should be out of reach for children and inside a sturdy cabinet with a child lock is the preferred choice. Keep wax candles away from anything that can burn, which as a rule is at least one foot. Be certain to blow out all candles if you leave the room and particularly when you go to sleep. Note: Find out more information with a list of cautionary tips for using candles safely at home. Inspect electrical cords often and replace any that get cracked or damaged. Discard any cords which have broken plugs or have loose electrical connections. If you do not have a home fire escape plan as part of your 10 fire safety rules - do it today! Make sure that you and everyone else in the house is familiar with the escape route. This applies to small children who will also benefit from reading our fire safety for kids guide. All the family should practice safe fire evacuation from the building at least twice a year. Contact the British Red Cross for emergency help with accommodation, clothing, and food etc. They can also help you deal with insurance companies. You should contact your local council if you have nowhere to live. They can often help with emergency council housing. Health and safety nominates a 'responsible person' to be in charge of workplace fire safety. They will have the responsibility for fire safety at business or at non-domestic premises. What are BBQ Fire Safety Procedures? UK Fire and Rescue Services offer a range of fire safety tips for barbecue and charcoal grill fires. Check out a guide that extends the BBQ fire safety advice with a few extra tips on camping and cooking. The UK Firework Laws state anyone younger than 18 years old cannot buy 'adult' fireworks or sparklers. It is also illegal to possess fireworks in a public area unless you are 18 years or older. What is Meant by Fire Safety? Fire safety is a blanket term for a set of practices. They intend to reduce the destruction to life and property caused by fire. Fire safety measures target the prevention of ignition of an uncontrolled fire and limit the development and effects once it has started. Fire prevention educates the public to prevent potentially harmful fires. Learn how best to survive a fire, reduce emergencies and damage caused by raging infernos. A fire risk assessment uses qualitative and quantitative methods in the systematic evaluation of the factors that determine the likelihood that there will be a fire, the hazards of such, and the consequences if it happens. A fire hydrant is a large connection point to a water supply. It gets used by firefighters when tackling uncontrolled fires. Community Fire and Rescue Services have legal requirements on their unlimited access rules to fire hydrants around the United Kingdom. How Often Should You Have a Fire Drill? As a general rule, most businesses should have at least two fire drills each year. Fire drills are best conducted on the premises. Consider making appropriate arrangements if you employ part time or shift workers.